A full colour map of the River Thames and Thames Path suitable for both waterways and leisure users. 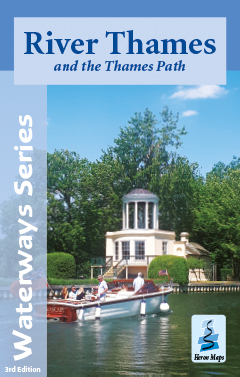 Includes navigation and historical information, visitor moorings, marinas and boatyards, boat hire centres, facilities for the boat user, rowing, sailing and boat clubs, shops and distance markers. Information for the tourist includes tourist information centres, places of interest, pubs, nature reserves, parks, churches, national cycle routes, long distance paths, public toilets, youth hostels, caravan and camp sites. The River Thames flows through southern England for some 215 miles, from its source near Kemble until it reaches the North Sea near Southend. It runs through tranquil farmland and countryside, the rolling Cotswold Hills, passes through historic towns and cities such as Oxford and Windsor and on to London, the thriving city it helped to create. The last century has seen commericial traffic replaced by leisure craft with numerous marinas dotted along its length, as well as rowing and sailing clubs. The Thames Path National Trail follows the river from its source to the Thames Barrier offering pleasant riverside walks. The River Thames map is available to buy online or by telephone from our business partner, Guidepost. Click on the logo below to visit their store.